Works great as a display rack for showing off your board, too! 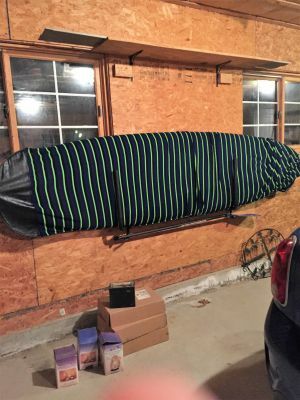 An awesome SUP storage solution. 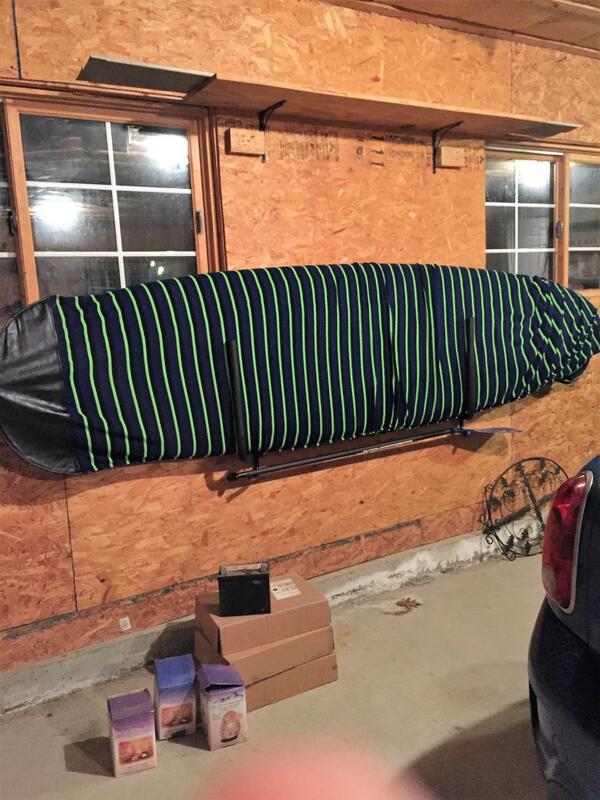 The SUP Stash is an amazing way to store your paddleboard at home, in your garage, or even at your beach house. Its wall-mounted storage arms help you keep your paddle board off the ground and out of the way, both protecting your board and helping you save space. How it's made: The SUP Stash is made from heavy-duty, 3/4" diameter tubular steel that's powder coated black and wrapped in high quality, plush foam (not the cheap stuff you might find around your basement pipes), making it both gentle on your board and exceptionally durable. How it works: The SUP Stash is super easy to use - just rotate the arms out from the wall if they're folded in and lift and slide your board into the rack. 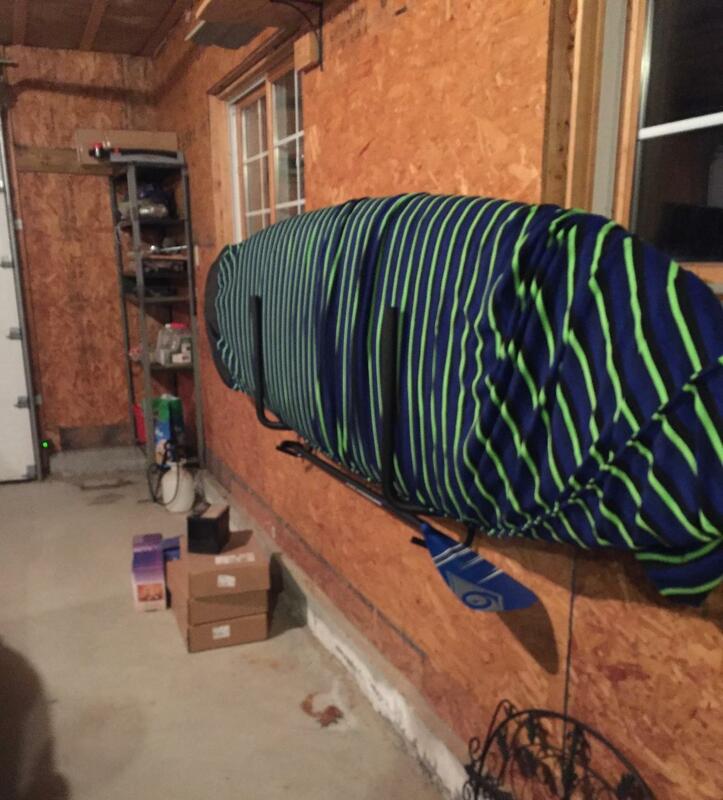 If you want to store your paddle board with the deck facing out you will need to remove the fin, or you can store it with the bottom facing out no problem. Since each arm is independent of the other you can also set them as close together or as far apart on the wall as you need to fit your board. When you take your paddleboard out to hit the water you can just fold the arms back up against the wall so they're not sticking out - piece of cake. Will it fit my SUP? With a 7" arm opening you can fit most paddleboards out there in the SUP Stash easily - you can see in our video that we have a 6"-thick, 12'6"-long Pau Hana Cadence RT displacement hull race and touring SUP that weighs 23 pounds in the rack and it doesn't break a sweat. If you're unsure, just check your board's measurements against the dimensions shown below! The SUP Stash has about 19" from top to bottom when you put your board in, more than enough to keep it secure - even if it's much wider than 19" you won't have to worry about it tipping out. It can support up to 50 lbs, too - most paddle boards out there! Hey! This is Josh from StoreYourBoard here today to talk about the SUP Stash, our newest paddleboard wall rack. It’s pretty simple, but it’s got some good features that make it a really great option. The rack themselves are here, so you get two sets of arms. Here, you got one here and one here. You got a touring paddleboard hanging from it right now, so this is it. The cool thing about it is it does swivel, so I’ll show you how to bring it down with tools. Youcan fold it against the wall, but built out of heavy-duty steel, three-quarter-inch tubular steel, has super plush, really, really great foam. It’s not that pipe stuff that goes around your basement pipes. It’s real heavy-duty stuff, really great protection for your soft edges. No problem about any damage, so it’s got that. What we have is 7 inches of spacing where your SUP can fit in, so that’s going to fit the majority of paddleboards on the market. Some of the really, really wide thick ones might not fit, so make sure to measure yours first, but 7 inches should fit majority out there. We have 19 inches from the bottom to the top, so that’s here. Your paddleboard can be much bigger; lot of paddleboards are 32, 36 inches wide. As long as it holds a decent amount of it, your paddleboard is not going to fall out because it’s stored in a vertical position. It’s not going to fall out. You got that. Then we also have a nice little paddle hook here, which is a great spot to keep more ties. Like I said, it comes with two. The hardware, it has two pieces, so it has four of these sets of hardware that encircle the rack and then they allow it to rotate so you can shift in and shift it out on your wall, and then it has two screw holes, one onto either side. You got eight of these screws, and then we also include four drywall anchors. We pretty encourage you to put at least one side, so at least one side of this; got to see it like that, at least one side of this into the stud. Because these are spread out about 8-1/2 inches, it’s going to be hard to put two onto a stud, so one onto a stud and then one with a drywall anchor, and that’s included in the instructions. Here it is right here. It’s a really, really good SUP rack—super sturdy but very, very compact against the wall. We get a lot of customers asking, “Hey, I don’t want to be taking it myself,”Some of the racks they go straight out into the room, 20 to 30 inches and your board is hanging out really far. For this one, if you want it really, really compact, perfect! from the back to the very tip is 10 inches that’s if you have the rack fully extended. You can actually partially extend it. You can move it. You’ll be able to swivel it, so that you can get it closer and fit right tight to your board and basically only have the rack out like an inch more than your board. It can go in for 10 inches to smaller, depending on what the board is like. A really great feature. Our customer love that. Here it is. Really nice paddle, so I’m going to take the paddle down first out of hook. Then we will just pull it out. One thing that I did want to mention because it’s so tight to the wall that the fins are pretty much not going to work facing in. If you want, you can face your fins out, so you can just reverse your board and the fins face out into the room. That’s fine! You can also take them out if you want to see the front side of your board for some reason, for the graphics, for display purpose, whatever you want. Here’s the two sides. They’re independent so you can mount them as far away or as close as you want, whatever length of paddleboard you have. This is a 12-6 board, so pretty long. If you just have the 9-6 recreational water, you can have a bigger touring one, you can mount them whatever it is that you want to properly support your SUP. Like I said, they do fold, so when you’re not using them, you can fold it flat against the wall, a really cool feature, and then comes straight out for maximum holding ability. This is up to 7 inches. Like I said, you can actually kind of get into this midrange where if your boards are only 3 inches thick, you can kind of thrust it against there and you got a closer fit to the wall if you’re really concerned about how far out it’s sticking. A lot of people who will use it in the garage worry about getting in and out with their cars in there, so this is a really good rack to keep close to the wall. That’s the SUP Stash from StoreYourBoard. Check it out today! Will you let me know when this is available again? I just bought one and it worked really well in my garage. There was a review on Amazon of the SUP Stash that said it wouldn't work for SUP's. I really like the design. Do you know if it will work with a Lifetime XL? I actually haven't seen that review on the SUP Stash that said that yet, so I am not sure what problem that person encountered. However, the SUP stash is built to hold SUPs up to 7" thick, and can adjust if your SUP is not that thick. Its weighted to support a board up to 50 lbs, when properly mounted to wall studs; and you can set the individual arms up as far apart as needed to accommodate the length of a board. It can also support fairly wide boards. You can see some photos of SUPs in the rack submitted by customers using it if that helps give you an idea, as well as our video on the listing, showing it in use. If your board is no more than 7" thick and less than 50 lbs, it should work fine! When will you these in stock again? This SUP rack will be in stock around July 4, 2017. You can pre-order it now if interested, and it will be shipped when in stock. Note, it is only available in a "gray" color now, so you would have to choose that option to pre-order. The other color is not coming back. I'm looking at ordering your SUP Stash rack and paddle holder. I was going to mount it on the outside of the back of my garage, and wondering how it will do outdoors? Our SUP Stash is not one of our recommended racks for outdoor use. It is a strong SUP rack, but as it isn't made of stainless steel or other marine grade materials, we would not recommend its use outdoors in areas exposed to saltwater or salt air; additionally, since it isn't coated for rust protection, we don't recommend its use outdoors in fresh water areas. In either climate, it would be subject to corrosion if used outdoors. You can find our recommendations for outdoor use here, https://www.storeyourboard.com/outdoor-sup-racks, sorted by climate (Freshwater or Saltwater areas). Is this rack suitable for outdoor use? My husband was skeptical but when these arrived, he was very pleased. They were easy to install and easily held our paddle board and oar. That was actually the part he liked best as keeping track of the paddle is always a challenge. They are attached to wood posts that he cemented in the ground. He believes they will hold up fine with our diverse climate. Great Rack for my Garage! I love this storage rack for my board. We have limited space in my garage and this is perfect as it takes up minimal space. Seems very sturdy and was easy for my husband to install. This was a great purchase and the perfect way to store our SUP. Loving it! From the time I ordered the product to the time the boards were hanging on the wall was about three days! The rack was a breeze to install, holds the boards great and above all, looks amazing! Put the racks up this past weekend. Very impressed with the quality of the racks and the ease of installation. Boards and paddles are now safely stowed and easily accessible. Great product. Looks great. Works great. Suggestion: If the "arms" that hold the paddle were longer, they would hold multiple paddles. I needed help with the installation because it requires locating studs and drilling, but once on the wall, the board goes in easily and it looks great. I actually installed it in my living room because my board is beautiful. I will try to upload a photo, hope it works! This rack looks great in the garage and was easy to install. I love that the bars swivel so it takes up very little space. Excellent purchase! I think at some point I will lower the rack as it's a bit high for me to put the board in, but considering it will mainly be for winter storage it's perfect! Another great addition to my garage thanks to Storeyourboard.com. My only regret is that all these items I have purchased from StoreYourBoard are made in China which I know is a global problem, but I would be willing to pay more if I knew they were made in the United States.